Among the myriad hurdles that need to be cleared for so-called flying cars to start ferrying passengers through the sky, some tests actually need to be conducted. Airbus, one of several companies trying to launch vertical take-off and landing aircrafts, says it’ll be able to do that by the end of the year. On Monday, the aerospace company published a number of photos of the Vahana plane, a single-seat vehicle that, Airbus says, is now being prepped for flight testing by the end of 2017. Yes, it looks more like a small helicopter, but companies involved in the development of VTOLs envision these aircraft to function more as a short-trip taxi service. Airbus has a particularly ambitious timeline of putting electric autonomous craft in the sky by 2020, aiming to send them between rooftops of downtown urban cores. In a blog post published Monday, the company outlined the process of transporting the craft to a new testing site in Oregon. 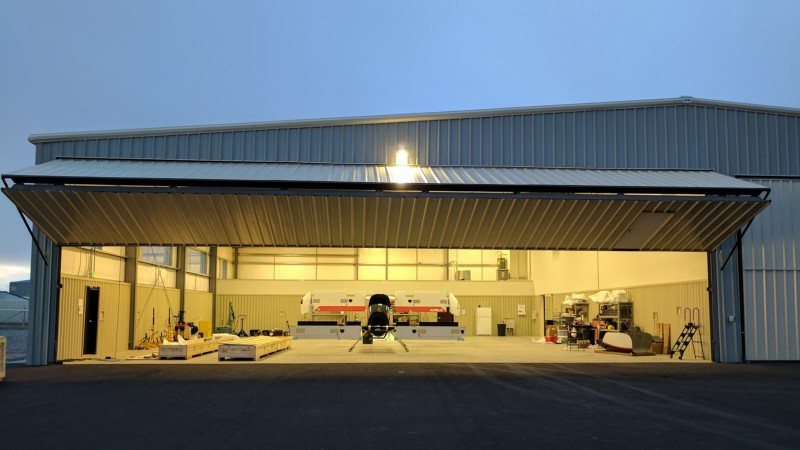 Once the caravan arrived in Oregon, the aircraft fuselage was unloaded from the truck at The Pendleton Unmanned Aerial Systems Range Mission Control and Innovation Center. The time had come for the first real-world test of Vahana’s landing gear handling and towing provisions. The aircraft was carefully towed along the quarter mile journey from the range’s main loading dock to its new home. In the photo above you can see Vahana engineers following along to make sure the fuselage made the last leg of the journey unscathed! Airbus is joined by Uber and more in the interesting-but-still-very-very-unlikely effort of producing a commercially available VTOL by 2020. But, at the very least, we’ll hopefully soon be able to see how these things look in the sky, even if it is only for testing purposes.